Maltese dogs are known for their striking white fur, which is why it can be particularly alarming if starts to fall out. Hair loss can be a symptom of a health problem or stress. 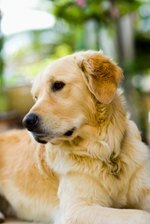 It is helpful to consult with a veterinarian to determine the cause of the hair loss. In addition, the vet may be able to administer medication to help with the problem. According to Dr. Holly Nash of Doctors Foster and Smith, hair changes are a common sign of hypothyroidism. This condition occurs when the thyroid gland is underactive and doesn't produce enough of the thyroid hormone. The Maltese may lose its hair, or the fur can become dry and brittle. In addition, the dog may gain weight, have skin issues and develop a slow heart rate. Most dogs recover well from the hair loss with life-long thyroid supplementation. The Dog Channel website states that Maltese dogs are prone to excessive licking, which can cause hair loss. If the Maltese gets bitten by a bug or experiences a similar irritation, it will often lick the wound to help the healing process. Unfortunately, many Maltese start to lick habitually and will cause hair loss and pigment changes. Ointments and sprays that taste bad can keep the Maltese from licking and are available at most veterinarian offices and pet stores. One of the most common reasons for hair loss is allergies. 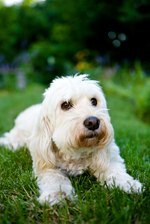 Allergies can affect any breed of dog, including Maltese. When the pooch comes in contact with an allergen, such as grass, trees, weed pollen or mites, its body releases antihistamine to combat the substance. Sometimes the body overreacts and creates issues with the dog, including hair loss. Antihistamines, fatty acid supplements, steroids and allergy injections are often helpful in treating the hair loss and preventing future problems. If your Maltese is allergic to fleas, just one bite can cause its body to react. Maltese dogs with flea allergies will often lose their hair around their hind ends. The skin may also become thick and inflamed. Eliminating the fleas and preventing their recurrence is essential in treating the hair loss. The veterinarian may also prescribe antihistamines and steroids to treat the missing hair.